Each year we set out about 3 weeks before Christmas to cut down our Christmas tree. Check out our Christmas Tree Memories to get a look at what a fun experience it can be to cut down your own tree. We bundle up and head out to a local tree farm where you can find a plethora of different types of Christmas trees to choose from. Trees like the Fraser, Balsam, and Douglas Firs and the Concolor, Norway, Blue & White Spruces. But what are the differences in these trees? What makes these types of trees good for use as our Christmas Trees? 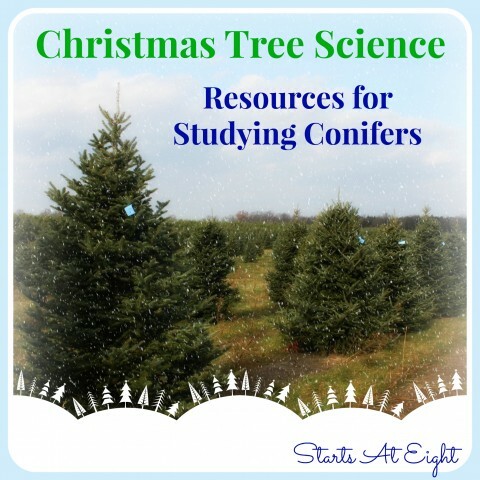 As a homeschool family we use this opportunity to include Christmas Tree Science as we have so fondly deemed it. All Christmas Trees are conifers. This means that they produce cones. They are also evergreen which means they do not shed their needles. Their needles (leaves) are unique because of their hard narrow shape. There are approximately 30 million Christmas trees told in the United States each year. It can takes as many as 15 years to grow a tree of typical height (approximately 7 feet). Average growing time is about 7 years. We prefer a Fraser tree for our home. The combination of the pleasing pyramidal form, good needle retention, dark blue-green color and pleasant scent have led the Fraser firs to become one of the most popular Christmas trees. The most popular Christmas trees are: noble, balsam, Douglas and Fraser firs and Scotch, Virginia, and White Pine. For more Christmas Tree Facts check out this printable called Real Tree Fast Facts. Heading out to cut our won tree gives us a great chance to check out the different types. Even if you are putting up an artificial tree you can still go to your local tree farm to check out the different types for yourself. Check out the National Christmas Tree Associations website for a quick look at Christmas Tree Characteristics. You can print the page out and take it with you to the tree farm. Real Trees 4 Kids – this is my most favorite site for studying Christmas trees. They have all their activities broken down into grade levels and it is all FREE! Constant Conifers NaturExplorers Unit – Do you know why conifers have thin, waxy leaves? Where are their seeds housed? Why don’t conifers produce flowers – or do they? What’s the difference between a conifer and an evergreen? These questions, and so many more, are answered through fun investigations. Christmas Tree Mini Unit – Looking for a fun and educational way to “jazz” up the learning for the holidays? This Mini-Unit includes the History and Tradition of the Christmas Tree; Types of Trees; Tree Farming; and How Artificial Trees are Made. Also includes a Review Worksheet; Math pages for younger and older students, activities and coloring pages.